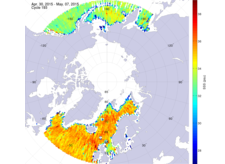 Slideshow: 2015 sea surface salinity maps of the Northern Hemisphere ocean (hover over images to pause the slideshow). These weekly gridded maps are made using the Aquarius sea surface salinity retrievals. They were obtained with algorithms developed by the Calibration/Validation working group, and applied to the microwave (L-band, about 1.4 GHz) brightness temperature measurements along the spacecraft swath. These maps show sea surface salinity expressed in practical salinity unit (psu) in the Northern and Southern Hemispheres at latitudes higher than 50°. Blue colors represent lower salinity, whereas red colors represent higher salinity. The date shown on the images (below) is the first day of that weekly measurement. Salinity can only be retrieved from space when the ocean is not covered by sea ice. Sea ice is frozen ocean water. It forms, grows, and melts according to the seasons, but some sea ice remains year round in certain regions of both the Arctic and Antarctic. 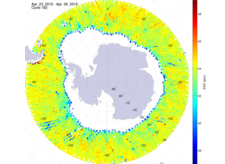 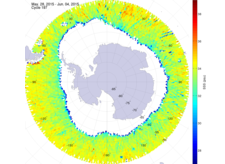 When a significant fraction of sea ice is present in the Aquarius measurements, salinity cannot be retrieved accurately. These areas were masked on the maps. 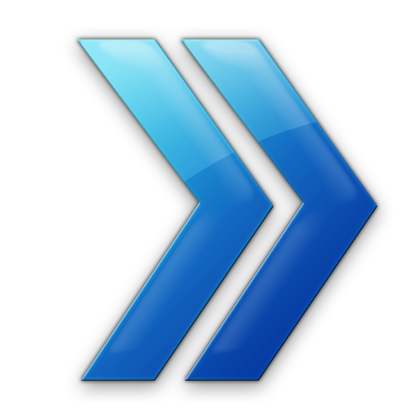 Other areas without data correspond to either a lack of observations due to orbit geometry and spacecraft maneuvers, or are coastal regions where salinity is inaccurate. When ocean surface salinity retrievals are possible in the Arctic Ocean, values are smaller than for other regions. 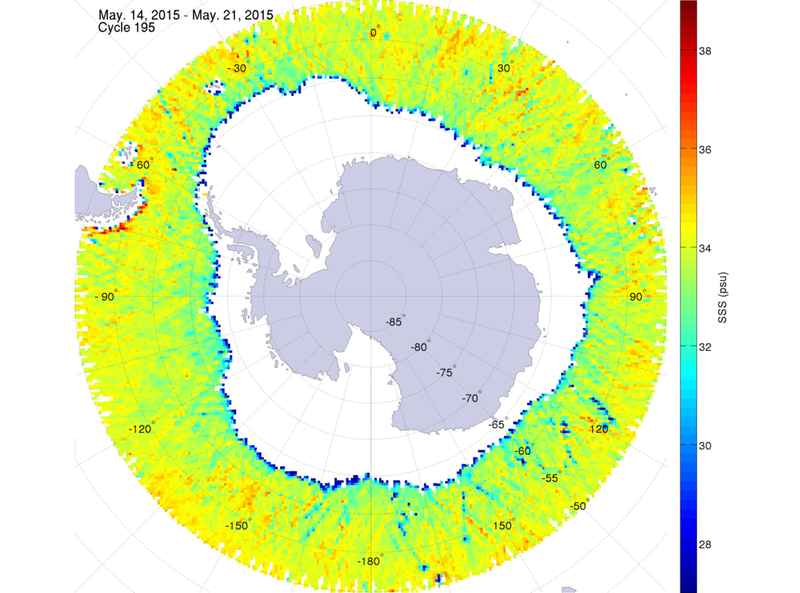 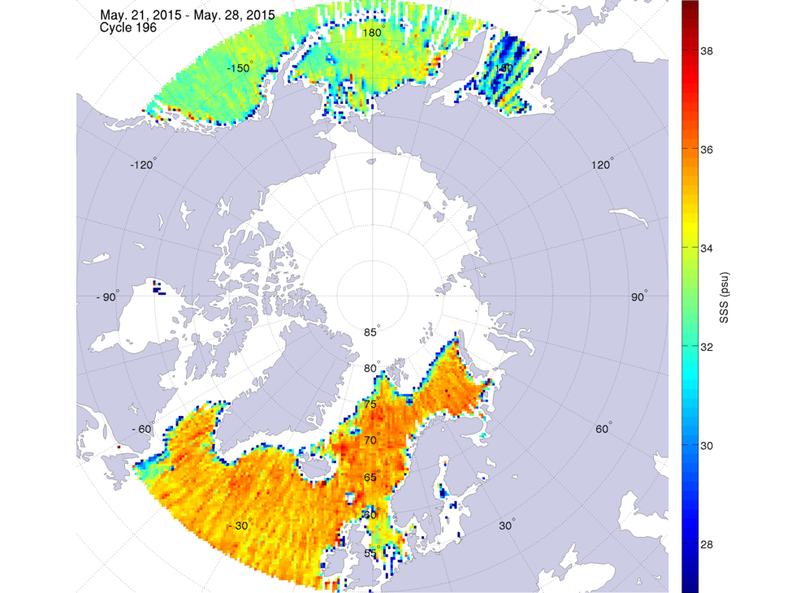 One can also see that blue colors are usually present in the vicinity of the sea ice margin. This may result from sea ice contamination of the Aquarius measurements, and do not necessarily reflect a low salinity. These maps also show the significant difference between the saltier Atlantic Ocean and the fresher Pacific Ocean. Ocean surface salinity in polar regions varies seasonally as ice freezes (i.e., leaving saltier water in the ocean) and melts (i.e., adding fresh water to the ocean). 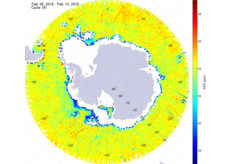 Slideshow: 2015 sea surface salinity maps of the Southern Hemisphere ocean (hover over images to pause the slideshow). 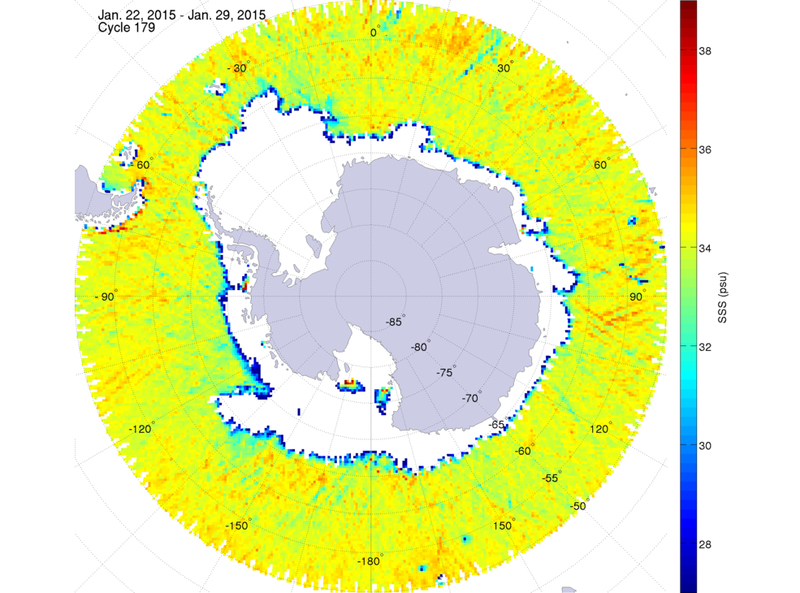 The Southern Ocean is an important source for deep water formations, and therefore the thermohaline circulation. Downwelling of upper layer water is induced by surface cooling and salt rejection during the formation and growth of sea ice. However, sea surface salinity retrieval in the Southern Ocean is challenging. There are strong winds, and the circulation in the Southern Ocean is dominated by the Antarctic Circumpolar Current, which is regarded as the largest World's ocean current. Salinity retrieval is less accurate for very rough sea surfaces. In addition, waters around Antarctica are cold. Aquarius measurements are less sensitive to salinity in cold waters. 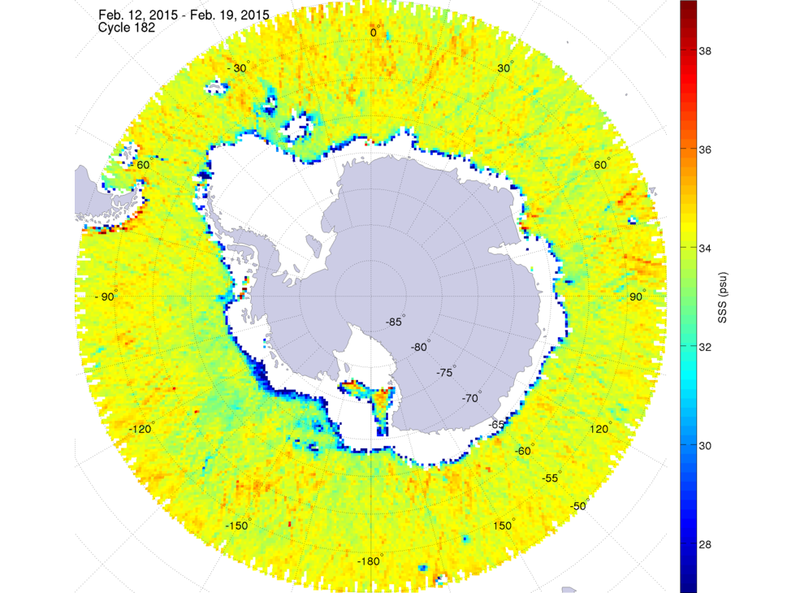 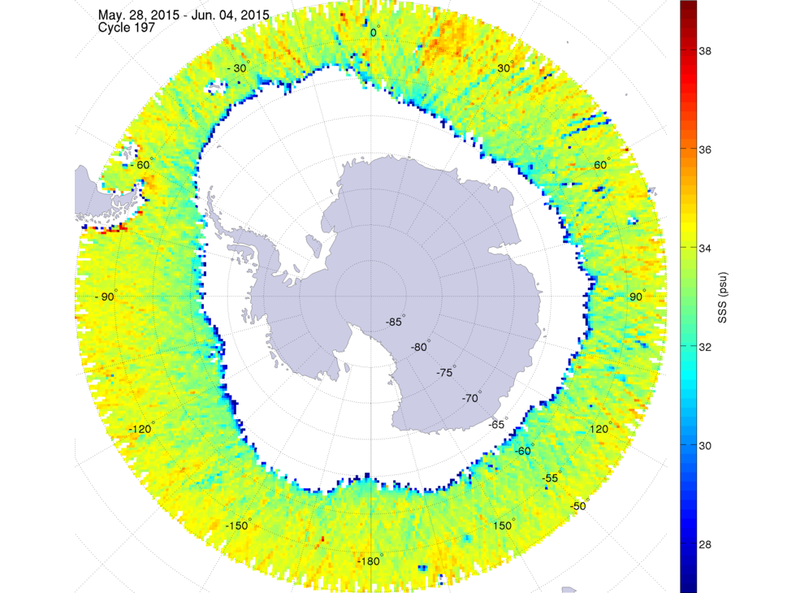 Finally, the presence of sea ice add an additional complexity to the monitoring of salinity in the high latitudes of the Southern Hemisphere.